For those of us critically attending at US foreign policy and world politics in general, the rise of Jair Bolsonaro in Brazil could hardly seem outside the scope of interest and –even more important–, influence of the US “Deep State”. So far, some indirect links have been shown, obviously in independent media, between Bolsonaro and the propaganda and psychological war tactics related to the CIA and other subsidiaries of the US Executive, generally linked to Wall Street and business interests. Let’s try and add some new –and more direct–, context and ties. 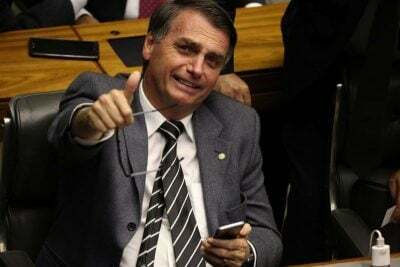 The far-right candidate who won the first round of elections in Brazil a few weeks ago –with an impressive advantage–, even when represented as a political “outsider”, has in fact been for decades the senatorial representative of a reactionary military elite and, more recently, a Pentecostal conservative population following charismatic leaders with enormous influence among the Brazilian middle and lower classes. They basically tell their flock who to vote for. Bolsonaro has called for coups, political assassinations and violent repression against minorities and the poor for almost 30 years. He is not an outsider, but the media is playing along, regarding him as an “enemy” of corruption and crime when in fact his intended policies mean the legalization of state violence and other nefarious forms of crime. None of them new or “anti-establishment”, but pretty much the opposite. His core followers seem to feel empowered these days by his first round victory, and the attacks on opponents and minorities are dangerously rising in frequency with fatal consequences, as the killing of a black capoeira teacher last week, Moa de Katende, an Afro-Brazilian cultural figure, for being in favor of the leftist Fernando Haddad. The LGTB community is also a main target. Even when Bolsonaro, who is also an ex-military, tries to appear more civilized to gather more votes from the political center, some of his core followers are racist gun-lovers ready to form paramilitary militias and raid the favelas in a way resembling Rodrigo Duterte’s Philippines. “…it is virtually impossible to overstate the threat level posed to democracy and human rights in the world’s fifth most-populous country as a result of last night’s election”. One of Bolsonaro’s most voted subordinates, Rodrigo Amorim, pictured himself ripping a billboard honoring Marielle Franco, the black activist for gay rights who was murdered earlier this year and whose killing is unsolved, which is a very common trait in Latin America regarding activists of all sorts. Besides the picture of their great achievement, the high school bullies turned politicians wrote: “Get ready left-wingers: your days are numbered if we’re in charge”. As Greenwald noted, the politician later erased the threat. The conservative, right-wing media –among other traditional actors we will review below–, have a share in the forthcoming –and already ongoing–, bloodshed, the only question is: how big? The Economist –among other “usual suspects” from the Western propaganda machine–, stated that the military would act as a “moderating influence” on an eventual Bolsonaro government. An excellent article by Jacobin magazine examines why the opposite is truth by reviewing some of Bolsonaro’s military advisors’ exploits and killings in Haiti. Bolsonaro travelled to New York and other important US cities in the second half of 2017. There he met business leaders and power brokers at the Council of the Americas (COA). This non-governmental institution is tied to the Council on Foreign Relations, where corporate leaders, bankers, all sorts of oligarchs and top-tier intelligence agents –the almost legendary, former CIA director Allen Dulles, was the Council’s director for many years before joining the agency–, as well as “ruling class” journalists and pundits gather to undemocratically decide where the world should go while maintaining status quo and corporate hegemony. Only a month after visiting the COA in New York, Bolsonaro named neoliberal Paulo Guedes as his official economy advisor, after having accepted his complete incompetence on the matter. In fact, the economic “ideas” of this long time Brazilian senator had passed from calling for the execution of a former president, Fernando Henrique Cardoso, for privatizing state businesses to call for the privatization of “everything”. He is a demagogue ready to cater to economic power –both local and international–, in order to enjoy carte blanche to impose “law and order” on the streets, which seems to be his foremost concern and surest path to popularity. In Bolsonaro’s and his supporter’s simple minds, crime and poverty are solved with bullets. Refusing to consider any bigger context behind these scourges, his ideas are as simple as giving the police free hand to “shoot first and ask questions later”, in a country that yearly witnesses the death of at least 5 thousand people by police officers, many of them innocent bystanders. In sum, an all-out war against the poor in a continent that has already seen its share of it. The meetings at New York with the COA, as well as the appointment of Guedes, a Chicago economist who was a university teacher in Pinochet’s Chile, started rallying business leaders and foreign investors to the candidate, although many weren’t saying it out loud. His stabbing on September the 6th, nevertheless, saw a surge in the value of the Real and optimism in the local markets as business leaders understood that the attack would increase Bolsonaro’s chances for the presidency. His first round victory only added hope to the banking and financial class. But what and whom exactly is behind the Council of the Americas? The COA long history of meddling in Latin American democracies in connivance with US government and a Latin American business and political elites make it a fundamental player in Brazil’s present political climate and soon to be decided destiny. Brazilian would be far-right president’s travel to New York went almost unnoticed in mainstream media and most independent media, as it happened when Bolsonaro wasn´t such a real threat and “Lula” was comfortably leading polls. With so little coverage of his trip to meet with the Council of the Americas, it isn’t a big surprise that nobody seemed to look into that institution’s historical exploits in Latin America. Seymour Hersh, the most important investigative journalist alive, researched the dealing of the CIA in Chile in the sixties and seventies against the Salvador Allende socialist government in his 1982’s Atlantic Monthly article “The price of power”. As he skilfully uncovered back then, the Kennedy administration instructed David Rockefeller to create the seemingly independent “Business Group for Latin America”, which subsequently renamed itself as the Council of the Americas. The institution’s charter was to counter the spread of leftist governments after the Cuban revolution, as Hersh explains. Americas Quarterly (AQ), the Council’s publication, as we will see below, remains a very influential source of mainstream media discourse to explain why the best political candidates for the Latin American/ U.S. business classes are actually the best candidates for the whole of its impoverished societies. On the verge of Allende’s election victory in 1970’s Chile, local and American business communities, tied by common interests and property over corporations such as the International Telephone and Telegraph Corporation (ITT), Anaconda Copper or Pepsico, started many efforts, directed by the CIA, headed in those years by Richard Helms and directly under Richard Nixon’s close aide, Henry Kissinger. As anyone with some knowledge in these dealings would know, intelligence agencies need to launder and send abroad hundreds of thousands and mostly millions of dollars when operating anywhere around the globe. In this case, the Council of the Americas served as one of the conduits for CIA money later used to pay for media propaganda, covert operations and political and military bribes. Other covert conduit was the U.S. Agency of International Development (USAID), as Hersh revealed. One of the Chilean heads of the international plot against Allende was Agustin Edwards, owner of the conservative newspaper “El Mercurio”, another council member. His network received almost 2 million dollars during the years the CIA and the business community were struggling with Allende, to unleash a brutal propaganda and psychological war campaign directed at the Chilean population. In the chaos and disinformation, the military coup would take place and the “communists” would be blamed. As we briefly mentioned, associated with the Business Group for Latin America/ COA were important senior executives from Anaconda Copper, in care of the bulk of Chile´s mining industry back then, ITT and Pepsico. Donald Kendall, CEO of Pepsico, was a very close friend –and contributor– to Richard Nixon’s political career. Kendall named “El Mercurio’s” Agustin Edwards vice-president for Pepsico in 1970, according to Hersh’s 1982 investigation. The massive lobby includes more than 200 transnational corporations. Most COA members have vested interests in Brazil and the rest of Latin America as well, which includes maintaining considerable pools of cheap labor and ownership over natural resources. As further proof of the COA’s “deep” agenda, a former CIA agent called Enno Hobbing, who participated in the 1954 coup that toppled Guatemala’s Jacobo Arbenz and then helped the CIA in 1970’s Chile as a liaison between the agency and the council, was subsequently appointed as the latter’s own principal operations officer. In the media realm, as it would be foreseeable, the COA’s publication, Americas Quarterly, and his executive editor, Brian Winter, enjoy a wide international audience. His opinions are circulated among corporate media around South America and Europe and repeated by tens of pundits around the world, making clear –and selling–, the Americas business elite’s take on politics (without stating so, of course). Readers around the world are not informed by Winter about the COA’s past or even the nature of its interests in Brazil and elsewhere in Latin America. This is exactly what is missing in corporate journalism regarding the rise of Bolsonaro: Brazilian right-wing, conservative media’s role in normalizing his candidacy as a viable, acceptable alternative to political corruption and street crime. A bit of the fairly documented past, regarding Rede Globo’s beginnings and subsequent exploits, should suffice. As the UK’s Channel 4 documentary “Beyond Citizen Kane” (banned in Brazil) showed in 1993, Globo’s Rio de Janeiro operation started in the first years of the Brazilian dictatorship with an investment of six million dollars by American media giant Time-Life, owned in those days by the legendary conservative –and CIA collaborator–, Henry Luce. For a better idea of the magnitude of that investment for Brazil in the 60’s, consider that the initial investment for the network enterprises in a different city of Brazil were around 300 thousand dollars. “Globo and the military government that took power in Brazil in a 1964 coup had a symbiotic relationship. Globo backed that coup and supported the military dictatorship right through until 1985”. The dictatorship smiled back at the most influential network in the country, reaching an audience way above its competence, and its owner, Roberto Marinho, whom on time became the most powerful citizen in Brazil. Still today, many rural Brazilians with no access to the internet understand the outside world through the opaque lens of Globo. Once, Globo told his viewers, back in 1984 when the dictatorship’s power was waning, that a street gathering of hundreds of thousands demanding democracy was actually a celebration of Sao Paulo’s anniversary. Among many other exploits by the Brazilian propagandists, when “Lula” da Silva had to debate the rightist –and media favorite–, Fernando Collor de Melo, back in his beginnings as a politician, Globo’s heavily-edited version of the debate severely diminished his possibilities at the polls. The network’s colossal reach has been traditionally unparalleled in the biggest country in South America and the 5th most populated in the world. “All of them (are) owned by wealthy families or individuals. However, plurality in media ownership here has failed to deliver a plurality of views. Media owners in Brazil are, without exception, white and conservative. They compete for audiences, but do so mostly from a same political and social points of view”. This is so in a country where more than half of its citizens are black or have, at least in part, African roots. As in the rest of Latin America, where media ownership follows the same rules and tendencies toward ownership concentration are strong, the fact that such ownership could represent the voice and interest of the many remains to be seen. “…And even if Bolsonaro wins, Brazil is no banana republic. Despite its dysfunctions and social problems, this is a country with strong political institutions. (…) Brazil’s institutions, unlike those of so many other countries where corruption continues unabated, have the means to hold powerful people accountable and to check the excesses of government. If he wins, that will also apply to Jair Bolsonaro”. This, sadly, completely contradicts reality, as the “Car Wash” case critically showed. In the past, on the other hand, military culprits of mass killings have proven hard to prosecute, joining the rest of the hemisphere, where military juntas supported and trained by Washington endured little to no jail time for their torture and killing of both innocent and combatants throughout the sixties and well into the seventies and eighties. Guatemala alone saw the slaughtering of around 200 hundred thousand indigenous people. Other voices were also brought to the subject recently, as the New York Review of Book’s Vincent Bevins, who explains: “Apologists for Brazil’s military regime plead that state murders numbered ‘only’ in the hundreds, but those numbers refer to documented urban cases and ignore entirely the thousands of indigenous people who were reportedly slaughtered as the military regime rushed to develop the Amazon”. October 28 could mark a breaking point in more than 20 years of Brazilian democracy. Bolsonaro’s core, militarized, conservative constituency would be an extremely dangerous one to empower, as recent attacks have shown. Mainstream media and corporate journalism in general completely downplay the danger awaiting by the end of this month, while also ignoring its own part in the rise of the far-right leader. Media corporations in Brazil and elsewhere have enormous vested interest in the results, having taken part in the spurious ouster of Dilma Rousseff and jailing of ‘Lula’, as well as selling any alternative to the Partido dos Trabalhadores as desirable. In the meantime, they keep diverting the attention from a corrupt system and establishment (as a whole) to corrupt politicians and street criminality, while leaving out the economic and structural sources of the dramatic material inequalities scourging Brazil today and fueling social division and anger. This seems to be the corporate media’s game in these days of anger and populism: to divert attention away from its preferred economic model’s destructiveness. As many times in the recent past of Latin America, the business classes resort to fascism, with its promises of far-right liberalization for the rich few and mass repression for the poor many, with corporate media as its propaganda arm.